It is always sad to hear about the death of someone special to you. But at this trying time, it is important to not only care for yourself but to also show your love and sympathy for the family of the deceased. Sending sympathy flowers is one of the best ways to do this, it shows you care but without imposing on a grieving family at such a sad time. 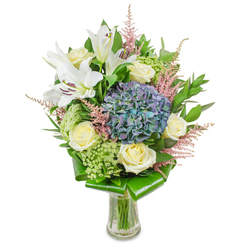 At Handy Flowers we can help you choose and send sympathy flowers that will truly show how much you love and respect the deceased and their family. It’s never an easy thing to do, so allow our florists to support you. Picking funeral flowers when someone passes away can be one of the most challenging tasks but we also know that some customers are caused anxiety about making sure they arrive at the funeral on time and in good condition. Especially if they have to send funeral flowers some distance away. Luckily we are on hand to help with everything in this regard, we can design and send funeral flowers on your behalf anywhere in London. This means whether you are attending the funeral or not, you can organise the most fitting funeral tribute and make sure they arrive on the day wherever they need to go. 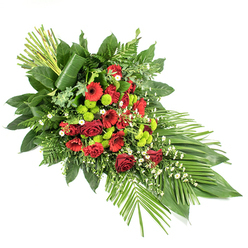 Order funeral flower delivery online or dial 020 3409 3030 and we will be happy to help you. At Handy Flowers we understand that losing someone you love is an incredibly difficult time, whether it’s a member of your close family, a friend, or someone you used to be close with, there is nothing easy about death. That is why our florists are committed to offering you support every step of the way when it comes to choosing and sending the right funeral flowers. Our florists have many years’ experience in this, so if you have questions about the process, or how to choose the most fitting floral funeral tribute, they are always here to offer advice and support. To make sure that your funeral flowers arrive on time and in the best condition, it is always wise to allow your florist to deliver them to their destination on your behalf. And this is definitely something we are able to help with. When you order a funeral bouquet from us, you can use us to have your funeral flowers delivered anywhere they need to go. We have a trusted network of couriers who will make sure your funeral flowers are where they need to be, at the right time. This saves you the worry of having to think about it. Simply order your flowers for funerals and we’ll do the rest. As much as no one wants to think about money when someone passes away, the reality is that funerals can be an expensive affair, and no one wants to cut costs when showing their respect for a loved one. However, at Handy Flowers we can help you find the highest quality funeral bouquets, but also help you save on costs. This allows you to spend money in other places, while still showing your respect with beautiful and personalised funeral flowers. You can speak to our team on 020 3409 3030 for a free quote! 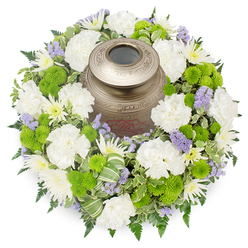 At Handy Flowers we know that in order to show your respect and love for someone who’s died, you want to have funeral flowers that really reflect who they are and what they loved in life. That is why we are pleased to be able to offer such a wide range of flowers for funerals to our customers. We have experience in designing everything from traditional funeral bouquets, to casket sprays and posies, funeral wreaths, letter tributes, urn tributes, and so much more. Just speak to a florist on our team to find out what we offer and request examples of our previous work for inspiration. 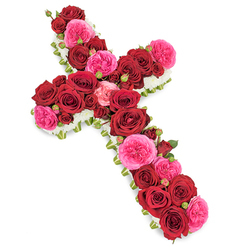 The one thing you want from funeral flowers is to show your respect for someone who has died, and that makes it super important to have personalised flower tributes. And at our flower shop, we will help you to design something that is truly unique and fitting for your loved one. 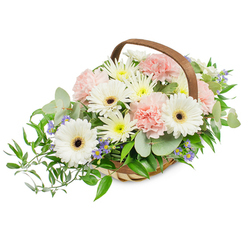 Whether it’s a simple letter tribute, a classic basket spray or a totally unique funeral tribute, our florists are on hand to make sure that your flowers are perfect for you and the person you are paying tribute to. If you have ideas already, just come and share them, otherwise we’ve got plenty of suggestions to help inspire you. 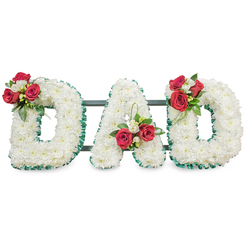 We will organise the funeral flower delivery so you will have nothing to worry about! 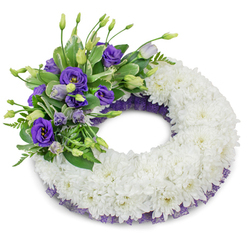 As a florist, sadly we deal with death and funeral flowers on a regular basis. As a result, our team are very knowledgeable about many aspects of organising funerals. Not only can we offer advice on issues around flowers, but we also know a lot about funeral traditions in a range of cultures, and how to make a funeral a truly glorious farewell. You can ask a florist on our team anything and if they are able to help they always will. Just call us on 020 3409 3030 to order funeral flower delivery!